Based as it is in a true story, one that has inspired several books, a TV movie, and an IMAX documentary, don’t go in expecting a thrill ride. There are no “pop out” effects, other than a stray rope or two, and the 3D conversion of Salvatore Totino’s cinematography emphasizes the depth of the crevasses and the vast expanses of sky at the top of the world. Everest is closer in tone to a somber tribute like Lone Survivor, with death, when it arrives during a fierce storm once the summit has been reached, coming unexpectedly. Director Baltasar Kormákur (of Contraband and 2 Guns) earns praise for staging the movie’s biggest gut punch moment toward the back of the frame, with neither pity nor ceremony. Awful things happen, and the movie moves on, nothing to be done. The approach works–but it also works you over, and I suspect some audiences will be cold to the achievement. Screenwriters William Nicholson (Gladiator) and Simon Beaufoy (Slumdog Millionaire) have effectively distilled the tragic ascent, the particulars of which continue to be argued over. By 1996, the small and solitary treks up Everest, the stuff of lore, has been replaced by more commercialized tours, netting operators like New Zealand’s Adventure Consultants and Seattle’s Mountain Madness up to $65,000 a patron. 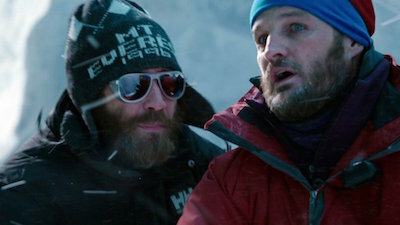 Adventure Consultants guide Rob Hall (Jason Clarke), a cautious “hanholder,” is contrasted with Mountain Madness’ Scott Fischer (Jake Gyllenhaal), a free spirit. The other characters are mostly Hall’s clients–Beck Weathers (Josh Brolin), a burly Texan, schoolteacher Doug Hansen (John Hawkes), and Yasuko Namba (Naoko Mori), who in her late 40s has climbed six of Everest’s Seven Summits and wants to be the oldest woman to reach the top. Also along is journalist Jon Krakauer (Michael Kelly), who would write the bestseller Into Thin Air, the book that has drawn the most controversy. 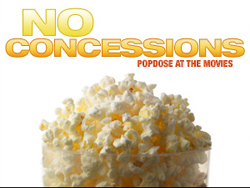 But the film, not based on that account, doesn’t go into any of that. It’s a straightforward, day-by-day record of events, including a breath-holding episode involving Weathers and a mountain bridge, and mounting concern as the weather grows increasingly fickle. Subplots are minimal; literally phoning it in, on satellite devices, are Keira Knightley, as Hall’s pregnant wife, and Robin Wright as Weathers’ spouse, who has tired of his mountaineering. (Other familiar faces include Sam Worthington and Elizabeth Debicki.) Everyone gets a moment in the spotlight, to register–Brolin, introduced wearing a signifying “Dole Kemp 96” T-shirt, shows other colors on the mountain, and Hawkes (a faultless actor) has a lovely monologue, going beyond the boilerplate retort “because it’s there” to explain, haltingly, what reaching the summit really means to him. In a brutal irony, his reaching the summit, as a storm closes in, seals the fate of the eight left dead on Everest (a terrible record sadly surpassed these last two years by an avalanche in 2014 and the Nepal earthquake this year). Everest ends, as many true-life stories do, with a montage of still photos tracking the lives of the people involved since the story unfolded. It’s a somber commemorative device, meant to underscore that we’re watching actual individuals rather than characters…but I always find myself distracted matching those individuals with the actors playing them. (Clarke is close; Gyllenhaal, clearly cast for an emotional or spiritual resemblance to Fischer.) Outside of what is for me anyway a misstep (Black Mass has one, too), Everest is a taut, absorbing recreation, convincingly produced on Everest (and in Iceland and the Italian Alps), with thundering sound that ricochets through your bones. But it’s appropriately scaled to its human element, and we watch it through the worried blue eyes of the base camp manager played by Emily Watson.